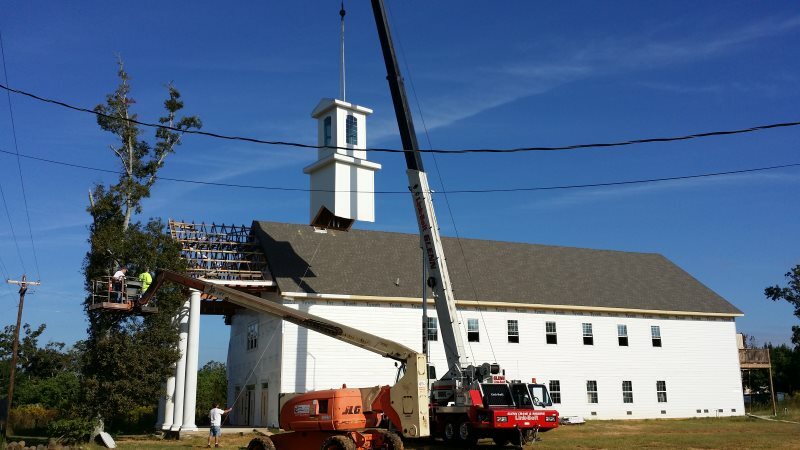 On August 30, 2015, 10 years and a day after Hurricane Katrina, Lakeshore Baptist Church will celebrate the construction of our new church building with a dedication service. With a seating capacity of 200+, we pray that the facilities will overflow with praise to our Lord and Savior Jesus Christ for years to come. For our “Sunday School” hour at 9:45 we will have a special speaker, Pastor Todd Wilson of Grace Covenant Baptist Church, Birmingham Alabama. The main service will follow at 11:00, led by our Pastor Don Elbourne. We extend a warm invitation to our entire community to attend the day’s events to the glory of God. 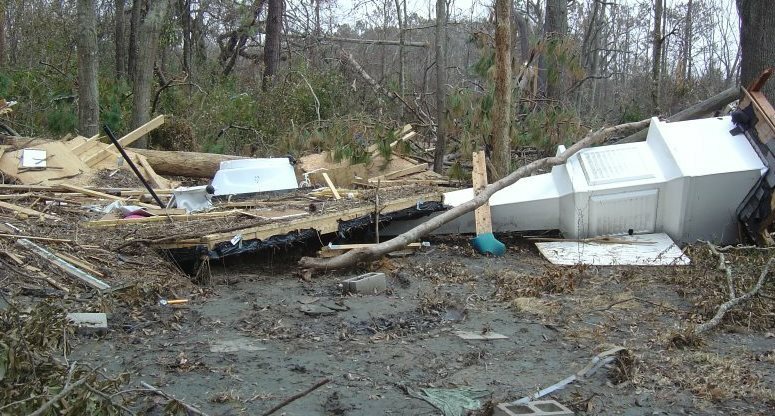 On August 29, 2015 Lakeshore Baptist Church will add the capstone to a decade of Hurricane Katrina relief recovery and rebuilding ministry. If you were one of those countless volunteers to flood into our area and generously offer your assistance, we want you to celebrate this milestone with us. We will gather in the new church building at 3:00 pm for an inspiring time of testimonies and praise. We also extend a compelling invitation to anyone from our area helped by the massive ministry that God empowered by His grace. 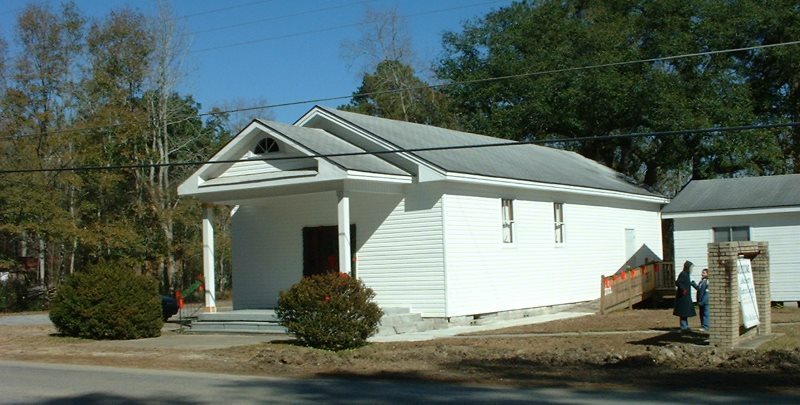 A jambalaya dinner, at The Mercy House, will follow the testimony service. 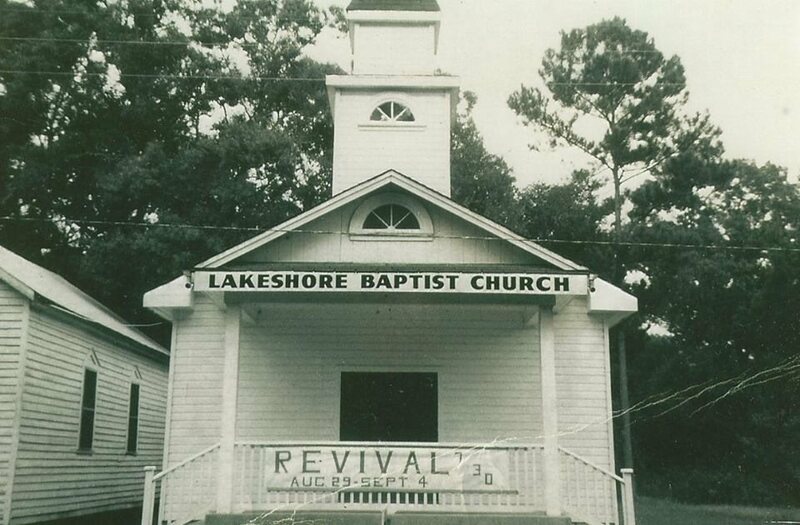 The Lakeshore Baptist Church building, constructed in 1952, sported a large wood-frame bell tower. Hurricane Camille stole the steeple in 1969. The congregation patched the roof, but the building lacked any adornment for about 30 years. 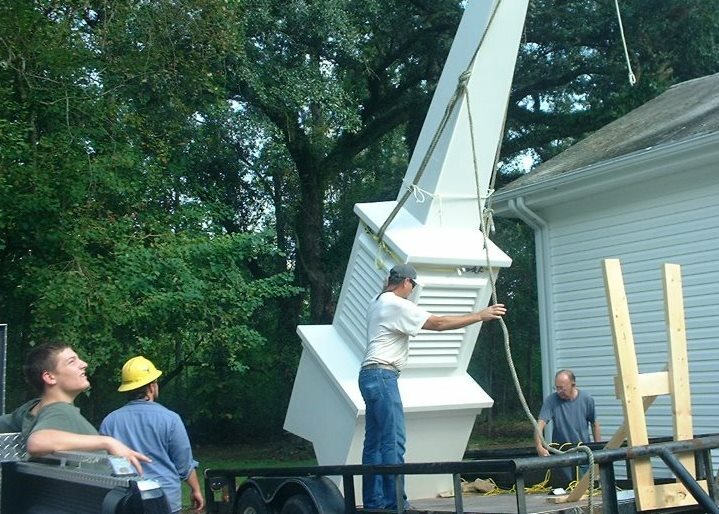 In 2001 the church decided to replace it with a fiberglass steeple. I remember traveling to Texas with Bro. 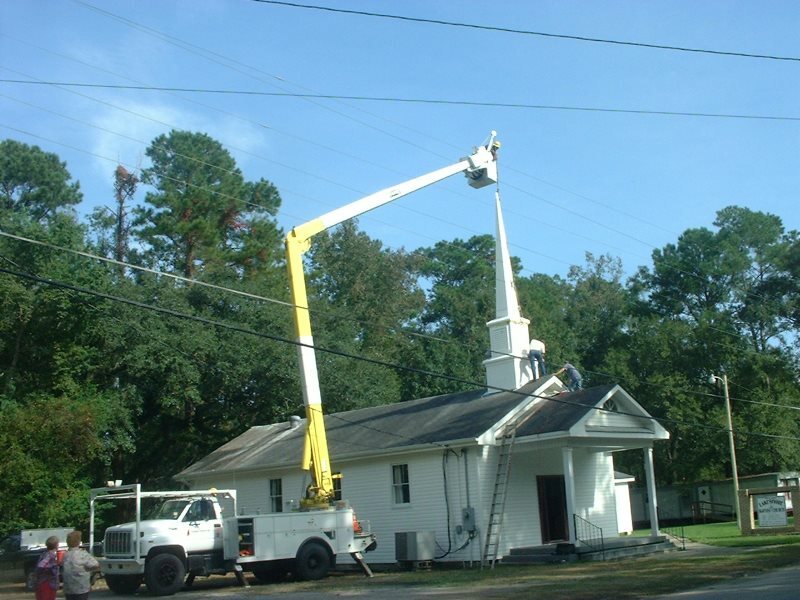 Ed McClendon, to pick up the steeple and bring it back on a flat bed trailer. Several church members and locals assisted in the installation. Little did we know that less than 5 years later another storm, of Biblical proportions, would hit us and totally demolish the entire building. 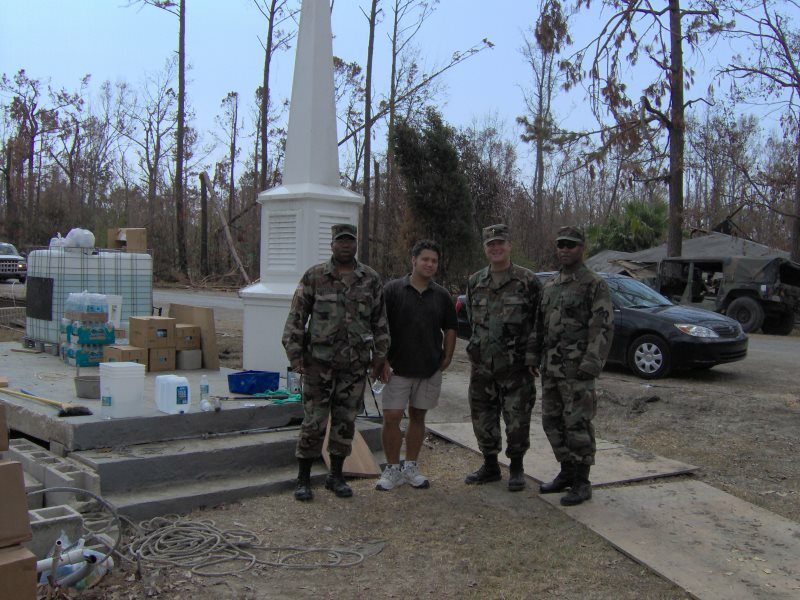 Hurricane Katrina threw debris blocks away from the church property in every direction. Nothing but the concrete steps remained fixed. 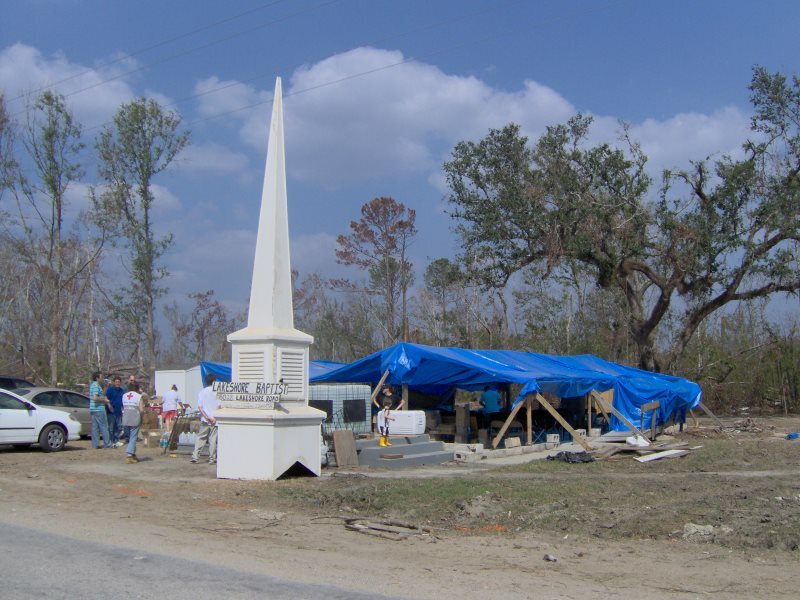 The fiberglass steeple apparently floated like a boat until it rested on the other side of the church property. 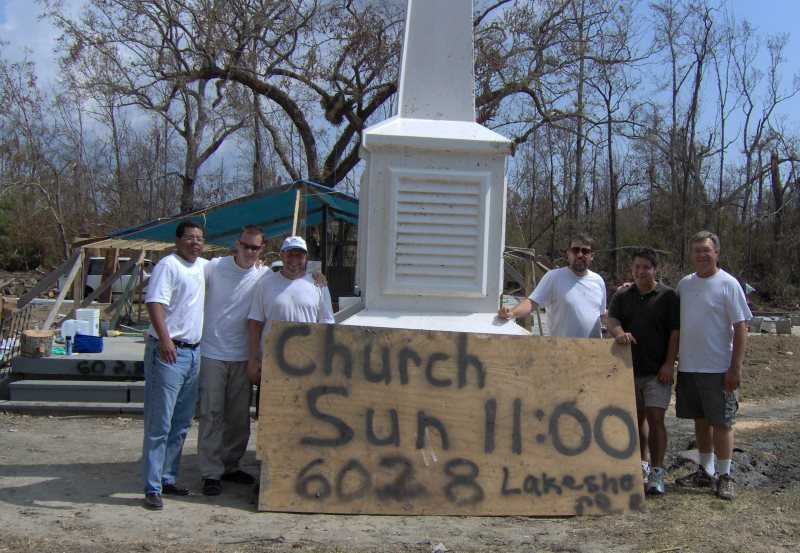 In the days following the storm, we drug the steeple out of the rubble and set it up on the side of the road. It became a landmark for our relief efforts. The rescued spire began to serve as a “Beacon of Hope” to our decimated community and a rallying symbol for thousands of volunteers that flooded in from across the country. 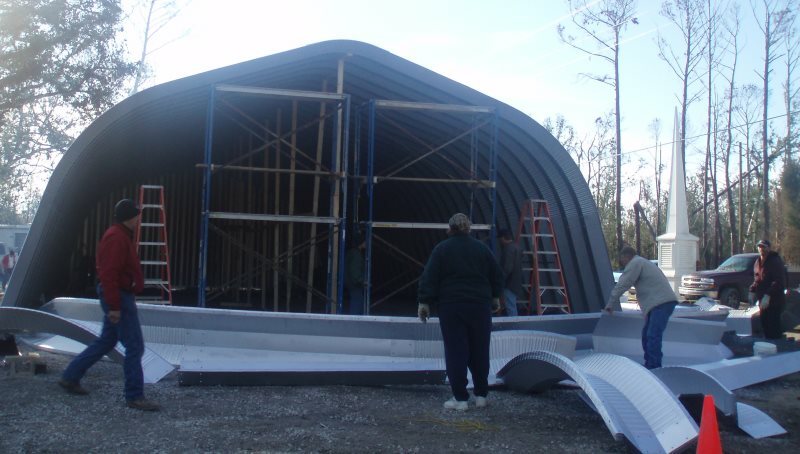 For eight years we worshiped in a “temporary” metal quanzet hut that bore no resemblance to recognizable church architecture. When we began to design our new church building we wanted to celebrate and honor our heritage while looking forward to the future. 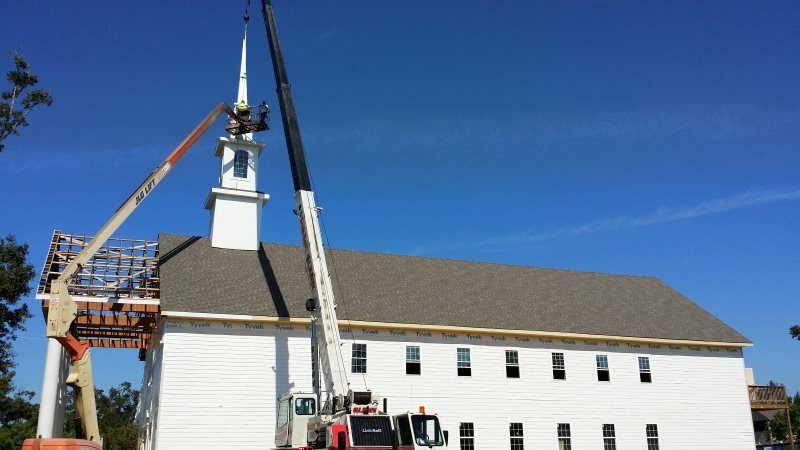 We decided to incorporate the old steeple into the traditional church profile of the new facility. 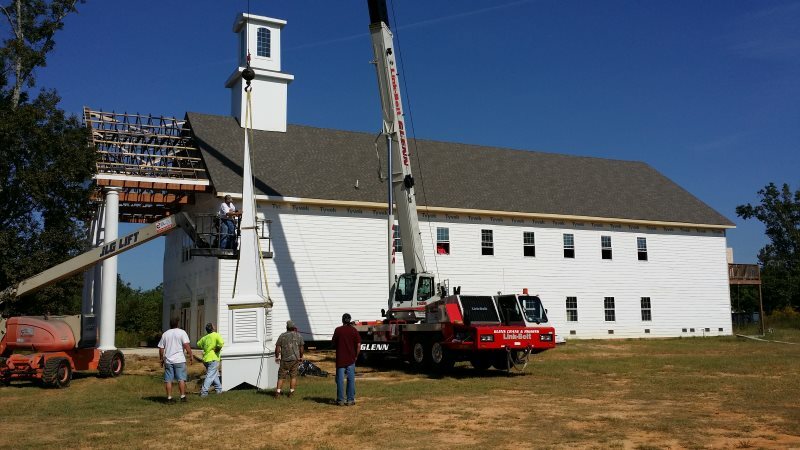 With the help of locals, and a big crane, the steeple now stands tall atop the new building, to the glory of God. As we near the completion of our new building, parking remains one of our biggest concerns. Would you join us in prayer as we seek the Lord’s will and provision in this matter? 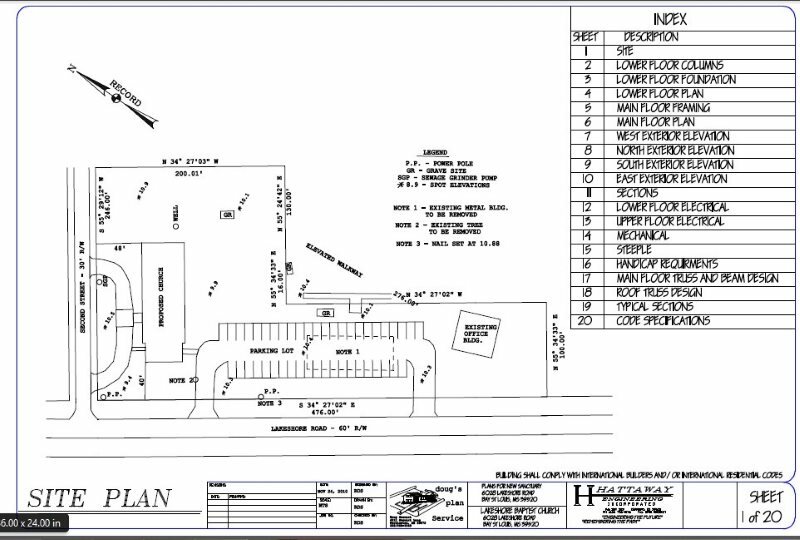 Our drawings – site plan PDF call for 45 spots to accommodate the 200 person capacity of the new facility. The proposal spans the area between the new building and the church office; the area previously occupied by the old metal church building and the entrance into the quonset hut distribution center. We plan to lay a limestone parking lot. An estimate for asphalt hit $40,000, so we are shooting for the much cheaper alternative, which we hope should run a little less than a fourth of that. The uneven ground, several extremely low spots, and the footers of the metal building, minimal finances, the need for big equipment, the lack of expertise and man power present challenges we need to overcome. With our growing attendance, some folks park over by the office, and others have to trudge through the mud, so we need to settle the parking lot issue asap – in the Lord’s timing and for His glory.